Graduation is a wonderful occasion, a chance to take pride in what you have achieved and look back on the fond memories you have gained. What better place to celebrate your special achievement than at FIREBREW Bar & Grill. FIREBREW Bar & Grill is the perfect venue for graduates, friends and family to enjoy this memorable occasion. 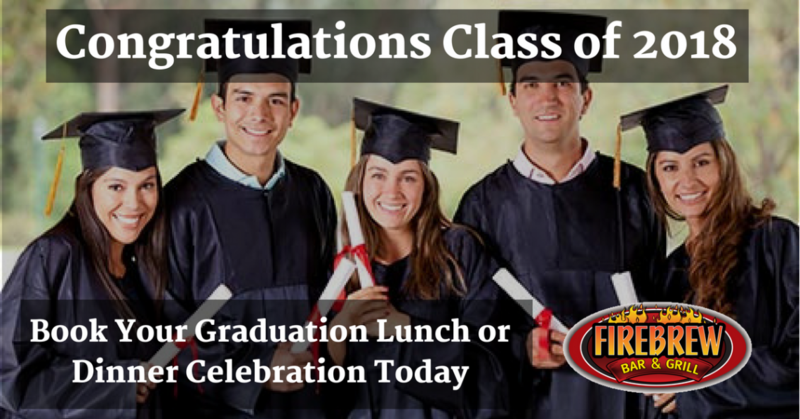 We are now taking reservations for Graduation’s lunch and dinner at FIREBREW Bar & Grill. Have a large group to celebrate the special day? Book your event on our patio for a “private” event and receive a $25 FIREBREW Gift Card to be used anytime after the event. Minimum of 20 people required for “private” event. Patio accommodates up to 35 people. Dates/times for private event are limited so book your event today! To make a reservation please telephone us on (757) 689-2800. Graduate meal is FREE with any group of 12 or more. Limit one FREE meal per group. Offer valid until 30 June 2018.